Captain Per-Erik Sjölin, and Mr Jack Fraser of the SAL Office in New York City. Mr Neilson has kindly offered to share his personal memories of these cruises. The texts have been compiled from several emails written in 2008. 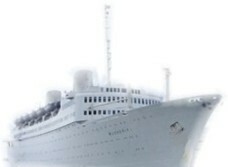 I was a passenger on very many more cruises, under the command of my perfect Captain Wijkmark, and his "deck" officers. We were always a happy ship and crew. EVERYONE. Passengers too. We also loved our service personnel and Chief Purser Eriksson and his capable staff. I could go on about the Radio and Engineering officers and staff, etc. Perfect. All of them. Many stories here. After many cruises with Capt. Wijkmark, on his Bridge, and my occupying Pilot Cabin #1, and going ashore in very many foreign ports, over the years, with my deck officers, having fun with which, I cannot speak about, my Colonel Father encountered a problem. Daddy did not wear a hat or cap. At 8+ Degrees LAT N. He got scorched on his head. Burned him, while going through the Panama Canal the day before. Daddy fainted the next day. 15 NM West of the Panamanian Pacific Coast. The M.S. Kungsholm's doctor kicked my Father off the ship. There were no decent hospitals within the next 2 weeks, or more. Gorgas Hospital/ U.S. MIL/ CZ was the very best place for Daddy. Daddy was very angry, but that SAL doctor made the correct decision, under the circumstances. He/ the doctor could not take a chance, as Daddy had a heart condition. Good doctor. We were ordered off the vessel by the doctor. No rush or hurry. We were all very gently taken care of the packing stuff by our staff., etc. So, Captain Wijkmark slowly turned us around back to Balboa, Panama to meet the Pilot boat to take my U.S. Army colonel back to the Canal Zone/ USA. Then, Cruise Director, Herb Colcord and Chief Purser Eriksson appeared at at our cabin door and asked my Mother; "Mrs. Neilson, How much cash do you need to get home? We have plenty U.S. Dollars on board. We will bill your account." Mother said; "I don't know, maybe $2,000.00?" They kindly brought back to her $5,000.00 in cash. (1971.) OK. That works. No credit cards then. That is the Swedish American Line. They knew their customers/ passengers. So, after all of our gear/ trunks, etc., were put onto a nearby small cargo vessel, and departed, we exited down the gangway to the aft of a U.S. CZ Pilot Boat. United States Military for my American colonel Father. 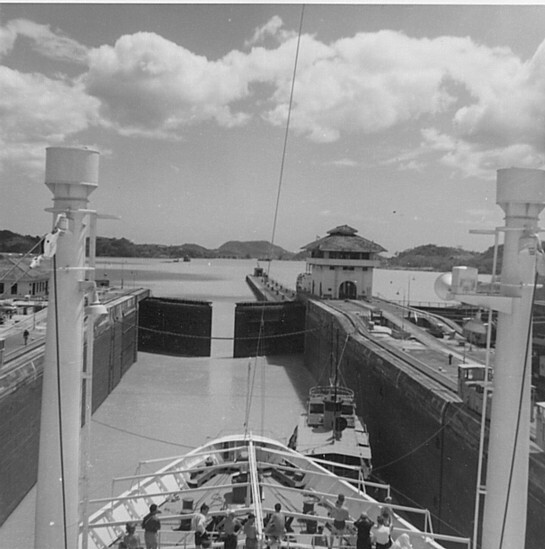 We were home in the Canal Zone (USA). As we slowly pulled away from the M.S. Kungsholm, I stood on the aft deck of the Pilot Boat, stood up straight, and issued to my Captain, Carl Otto Wijkmark, who was watching us from the Starboard Bridge, my very finest salute. Colonel Daddy was sent to the famous, and very excellent, Gorgas Hospital in the U.S. Canal Zone. Howard Air Force Base. (I think that U.S. Senator John McCain was born there in the 1930s.) U.S. Army GEN Gorgas, M.D. was the doctor that solved the malaria problem for us, during the construction of the Panama Canal in the early 1900s. You should have seen Daddy's cute attentive American USAF nurse. She was 29 and I was 21. Another story. We spent a week there. I met her USN / UDT buddies. They, U.S. Navy, took me out one day to visit one of the sharkiest places on Earth on a small boat. The UDT guys went overboard with their tanks and left me alone in the boat. I saw quite a few large sharks below, of various species, and started cranking the engine to get their attention. 18 foot tide there too. I did not take a swim that day. One of the UDT guys surfaced and asked me why in the hell was I cranking the engine? I told him why. He scowled at me and told me to "knock it off", drink my beer and remain calm. They were there to specifically swim with the sharks and this was nothing compared to what they used to do off of the garbage dump cliff at Guam Island in the S.W. Pacific. WILCO. I drank my beer. They all arrived back onboard safely. Crazy men. Later, they all had a good laugh at me and took me to a Navy bar. I got sunburned that day. 8 dgs N LAT!! St. Vincent, or possibly, St. Lucia Island/ Windward Islands/ S.E. Caribbean Sea. Winter/ Circa 1970. It was morning. Beautiful, hot and humid. (LAT N. Apprx. 12 dgs.) Typical wx. The M.S. Kungsholm was setting her starboard anchor near offshore. The volcanic mountains near onshore were steep. Meaning that what was below the water was also steep. Our heavy anchor slipped off of an undersea cliff and went into a "free fall". The bow deck operator did all that he could to apply the brake without any success, and then quickly and wisely took cover behind a bulkhead. There was a huge cloud of rust dust and brake lining smoke coming out of the anchor housing hole, as the anchor chain unreeled to the endpoint. A very long chain. I was prepared to duck behind the steel outside wall of the Bridge as soon as it broke, of which I was 100% certain that it would. The noise was deafening. But, to everyone's amazement, it did not. All links held fast. Whew! The bow of the ship violently jerked down somewhat significantly at the end. My Family eating breakfast below had zero idea what had happened. Their table mates suggested that my Daddy go up to the Bridge and inquire of me as to what had happened, as they all knew that I was always there during all arrivals and departures. Daddy came up and I showed him what had happened, while we were reeling/ winching back up the STBD anchor and prepared to set the PORT anchor. "No harm and No foul." We had survived well that mechanical mishap due to a well engineered, constructed and maintained anchor chain! The day went well after that. I did not go ashore that day. But, an hour or two later, I noticed from the Bridge that some of our passengers were tossing shiny coins overboard from the Sun Deck to the native kids on small canoe type boats for them to dive for and retrieve. Great fun for both sides. I also noticed that the kids had some sort of shiny scum on their scalps. (I verified this w/ our 7 X 50 binoculars.) THEREFORE, being the great, humble and humanitarian American Son that I am, I had a great idea. I quickly went below decks and grabbed a small case of our small bars of SAL "green" soap. Not Ivory. It did not float. I brought it up to to the Sun Deck and we all started tossing the soap bars overboard to the kids and indicated to them how to apply it. They loved the soap bars and took salt water baths. Then, we tossed more coins. They went home prosperous, clean and happy. Their mothers must have been appreciative. Good day for us too. FUN !! Lots of Laughs. Both sides. Cute kids. Good divers too. Made a life memory. Off to a new port. Barbados, B.W.I. 90 NM/ E.
No matter where in the world we went, we were the very finest two cruise ships afloat. This is not bragging, but a true fact. Not only did we all know that, but the many ports that we visited knew that as well. It was indisputable. Including, New York City. 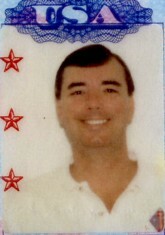 During the 12 JAN to APR 1973 South Seas And Pacific Cruise, I joined the M.S. Kungsholm at Honolulu, HI, USA on 28 MAR 73 and departed her at Acapulco, MEX on 7 APR 73. I was 20 years old. The morning that I boarded the Kungsholm, I was severely late for breakfast. They were all waiting for me at Capt. Wijkmark's table. My Father, COL A.M. Neilson, scowled at me. He hardly spoke to me all day. I don't blame him one bit. I had screwed up. Captain Carl just smiled and ordered my gear to be put in my Pilot's Cabin No. 1 on the Bridge Deck. Carl knew. So did Daddy. In the culture of the U.S. MIL, you can mess around all night, but you need to be fit for duty the next morning. On Time. I had flown a cutie pie, who I had had a crush on since I was 15 years old, from Los Angeles to Hawaii with me w/ a RT air ticket. We had too much fun together, prior to my Kungsholm's arrival at HON. On the morning of 3 APR 73, the Kungsholm began to approach the West Coast of California. It was a spectacularly gorgeous day. For some reason, Capt. Wijkmark wanted me close to him that day, and, so, I was there for him. The whole trip into the busy Los Angeles / San Pedro Harbor. We were isolated on the wing of the Port Bridge extension. Just the two of us for about two hours. We were left alone. Our First Officer, Soren Harrstedt, handled the Pilot and related duties, once he/ Pilot came aboard. Ouch !! But, Ok. Carl stiffened. He was a proud officer. Next, I informed MY Capt. Wijkmark that he was the Commander of the most beautiful cruise ship in the entire world. Admired by all. Further, that he was loved by all officers, crew, passengers and staff alike. I slowly grasped his hand into mine and squeezed it where no one else could see. Carl thanked me with his eyes. We progressed into the docking of the M.S. Kungsholm, at the Port Of Los Angeles/ San Pedro, as usual. Uneventful. 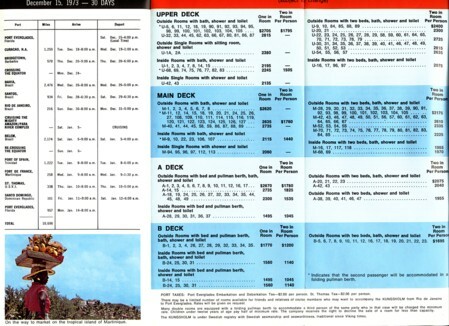 Later on that trip, at Acapulco, my mid/ junior deck officers, took me "up the hill" on my last night to the cantinas. How nice of them. Not known about by either of COL Neilson or CAPT Wijkmark. I was VERY safe. Would not be so today in 2008. I flew home to Tulsa, Oklahoma, via Dallas, TX, the next morning. Brazil - West Indies Cruise. 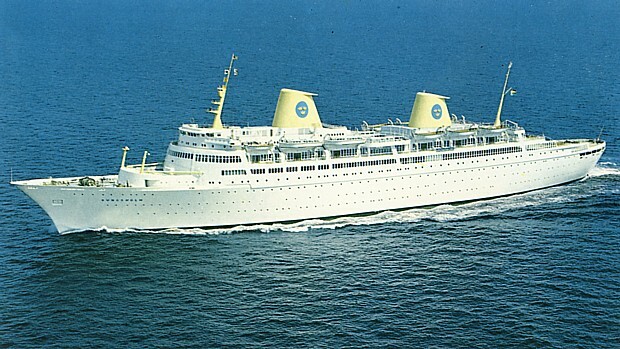 I joined this cruise on 20 DEC 73, after completing my "Final" exams by flying to Barbados, via JFK-NYC, from Tulsa. There was a very unfamiliar, unknown Captain on this cruise. Capt. Bertil Gronberg. At least Ronnie Morton was our Cruise Director. Carl was probably deservedly home in Sweden for Christmas. 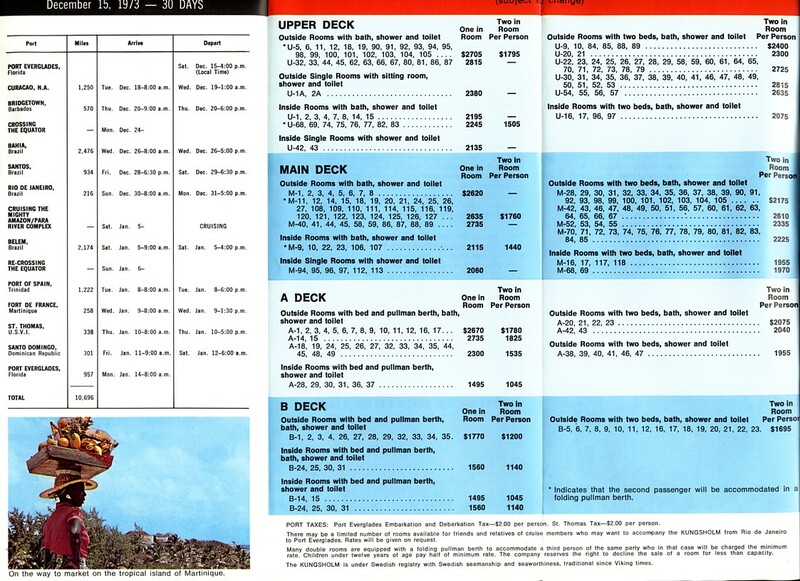 I was placed in the "Social Staff" aft A-Deck area on this cruise. I shall not comment further. I was not a bit pleased. Used to being in my Pilot Cabin #1, with my male deck officers, who dated gorgeous blonde hairdressers and nurses. Different Captain and VERY different cruise for me. They did not bother me. Knew better, I guess. I am more into uniforms than silky smoking jackets and slippery robes. They were chosen for a good reason. To dance and keep their mitts out of the estates of the old Biddys. They performed well. Left me alone. We well tolerated each other. They knew me and vice versa. RIO!! New Years Eve. 2 Days. When we docked at Rio, Grandmother (GM) marched us down the Gangway to her large waiting Mercedes Limo sedan, provided by Amsterdams (jewel merchants). They knew her well and were eagerly waiting for her arrival. That car and driver were assigned to us ONLY for 2 days. We first went to the store for about 2 hours. GM always purchased a set of colored gems each year. This year was the "Emerald" year. Got a nice ring, bracelet and earrings. GM asked me; "Bob, is there anything that you might like for someone (female)?". I responded : "Yes. I would like 2 earring sized auqamarines for Mary." She was marrying my best Friend soon, and GM liked Mary a lot. Done deal. No Charge to GM. Freebie. THEN!!! Here came the hammer. The head salesman draped a huge, dripping set of diamond crusted emeralds hanging off of a necklace around GM's neck in front of a perfectly placed mirror, with great glee. Exclaiming, "Mrs. Giffey this is YOU!" GM took a peek in the mirror and simply said that she was quite satisfied w/ her pearls, and that it was time to go. Would they accept her personal check drawn on the national Bank that she owned 100% of in Kansas City? Of course they complied, and she left with the goods. Probably took about 3 weeks for that check to clear back then. But, it was good. About $10 K. No big deal. GM really was fond of her cultured pearl necklace. Off we went to see every one of the beautiful spots in Rio in the Mercedes with driver. Daddy was most happy to be released from the jewelry store. Bored as hell. True. Some years later, circa 1978 +, I received from Captain Wijkmark a letter describing his sorrowful duty to take our empty M.S. Kungsholm into a British port ( Portsmouth ?) for retirement. High fuel costs, AND, high Swedish taxes killed her. Even after she was re-flagged for a year or two. It was too late and her long ranging/ long cruise patrons were dying off. As we all know, we had a very wealthy and increasingly elderly passenger corps. Most of the cruises that I was on had 99% repeaters. They not only knew each other WELL, but visited each other's homes in between cruises. There were also onshore visitations to passengers' homes by our beloved crew staff and vice versa. I once visited our dining room steward, Bert Sommerfelt, my "drill" math tutor, appointed by Professor Daddy, on the 1963 Med Cruise, at his home in New Orleans, LA , when he was the Head Waiter at a famous N.O. hotel restaurant in the French Quarter . I was in college at the University Of Tulsa and got an opportunity to fly "Right Seat" w/ a new pilot in a small plane to Lakeside Airport for a weekend. Bert introduced me to " Goldwasser ", when he took me, as his guest, to his elegant restaurant. I have not swallowed gold flakes since. The last time I spoke to Carl was when I was onboard the NCL "Sunward" to the West Caribbean. A terrible ship/ cruise. Circa 1982. My first cruise since my SAL days. I went to the radio station and called my Captain Wijkmark, via HF Radio/ Telephone in Sweden . I delivered to Carl a very bad SITREP about this mistake, and thanked him for the SAL. That was the last time that I heard Carl's voice. To this day, I remember Carl often. A truly wonderful/ honorable man and Captain. I miss our Captain/ Master Carl Otto Wijkmark. The best of the best. No one who knew Carl would ever disagree.